The second installment in a multiplayer open world game series developed by Ivory Tower Studios, which employs the creators of the Test Drive Unlimited series. Like the first installment, The Crew 2 features open world races taking place all over the United States of America. By the end of 2004, The Crew has been released on Xbox One, PlayStation 4, Xbox 360, and PC / Windows. This racing game has been a debut project of Ivory Tower studios; interestingly enough, some of the developers working for Ivory Tower had some experience in the racing genre, as they were the ones who created the Test Drive Unlimited series, while working for Eden Games. The Crew, despite not being flawless, was well received by the gaming community, which resulted in the release of two large expansions – Wild Run and Calling All Units. It was not until May 2017 that Ubisoft announced they were developing The Crew 2. The PC, PS4 and XONE release of The Crew 2 features much more than the original installment. Developers decided to abandon the police vs criminals type of story and instead they give at players’ disposal four different motorsports families and an open world, where players can feel like at a playground. Our main goal is to mark our presence at the U.S. motorsport arena. To achieve this, one has to participate in numerous racing competitions. The aforementioned motorsports families specialize in different kinds of races – street, pro, freestyle and off-road. During the game, players acquire various vehicles and upgrades, which are stored at a base (each family has a separate one), where one can customize his machines. In The Crew, one could drive only cars. In the second installment, the developers decided to go one, or even two steps ahead – in The Crew 2 players participate in races while steering fast motorboats or piloting airplanes. The vehicle handling model opts for arcade driving. With spiral tracks filled with obstacles and other attractions, such as quarter pipes, the game encourages players to learn particular racetracks. The Crew 2 does not impose anything on anyone – the featured world is available for players to explore right from the start, allowing them to go anywhere they want, anytime they want. 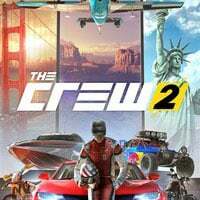 Like its predecessor, The Crew 2 highlights its social aspects, thanks to which players can not only race each other online but also share their achievements or best moments. The visuals featured by the game have been significantly improved in comparison to The Crew. Vehicles are polished to the smallest detail, cities are more elaborate (sometimes one can even drive on the rooftops), while every other aspect of the game is accompanied by various visual and sound effects along with the dynamic day and night cycle and then some.